"The Best Clean You've Ever Seen"
* To be eligible you must live in the Pleasanton, Dublin, Livermore, San Ramon, Ruby Hills, Danville, Blackhawk and Sunol areas in the Tri-Valley California. This offer can not be combined with any other offers. Offer subject to availability. Ad valid only by mentioning our internet promotion when calling. 1 room is equal or less then 100 sqft. Monday - Friday 9AM - 5PM, Saturday and Sunday by Appointment. How do we compare to the average carpet cleaners? We call them the "Wet & Jet" cleaners. Their way of cleaning is likened to: taking a shower, wetting & shampooing your hair, and then getting out & drying off. They tend to forget one very important step; THE RINSE! With our method we extract all of the soap residue from your carpets with a DEEP FIBER RINSE, leaving your carpets cleaner longer and having less chance of re-soiling. 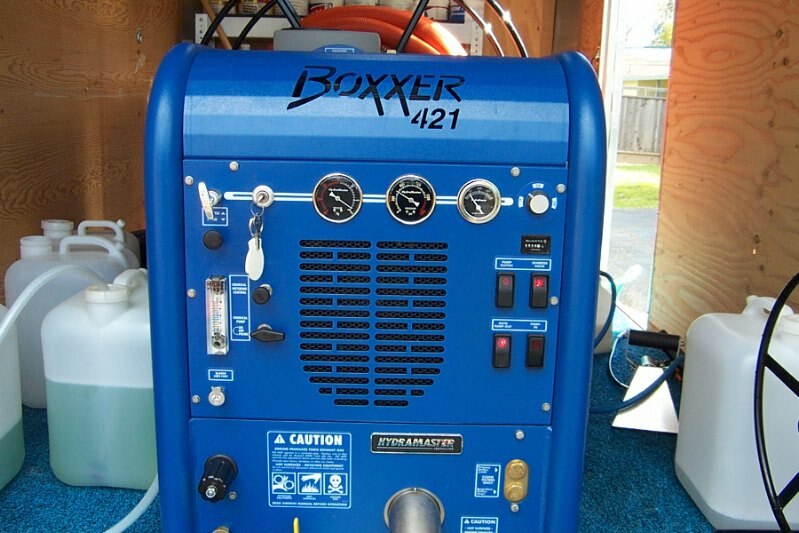 Our Equipment - "Boxxer 421"